Congratulations to our outstanding students who are graduating this spring! Admission to the commencement ceremony is by ticket only. Graduate tickets will be distributed the week of commencement (beginning Monday, April 29) through the Student Services office on the WSU Health Sciences campus. Each graduate will receive one ticket for themselves and eight to distribute to their guests. If you are the family or friend of a graduate you can get tickets from them directly. Faculty who will be seated on the stage, musicians, photographers, staff, volunteers and student ambassadors do not require a ticket, but must enter through the stage door. 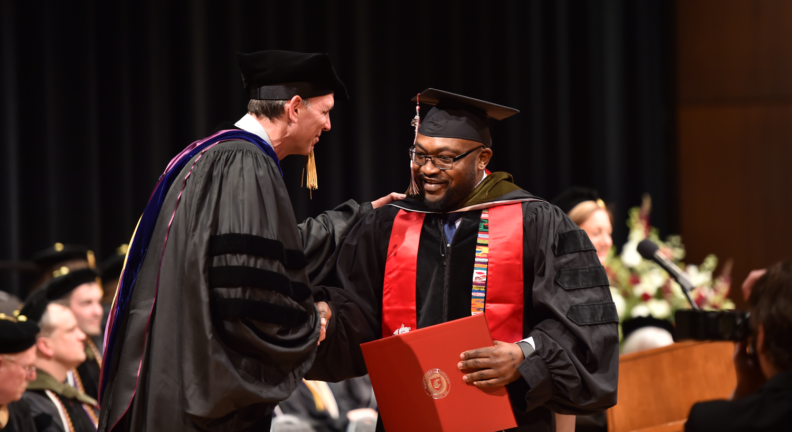 If you are a preceptor or alumni who would like to attend the commencement ceremony please contact us at gocougs@pharmacy.wsu.edu or 509-358-7651 regarding ticket pickup/will call. If you would like to request wheelchair seating or a sign language interpreter at the commencement ceremony please contact us at gocougs@pharmacy.wsu.edu or 509-358-7651. If you would like to view the commencement ceremony but are unable to attend in person or do not have a ticket, there will be a livestream of the ceremony available. The college will host a viewing of the livestream on campus during the ceremony. A link to the livestream will also be posted on the commencement webpage shortly before the ceremony begins. After Image Visual Services will be photographing each graduate at the Commencement ceremony. Proofs will be mailed and emailed to the addresses provided by the graduate at ceremony line-up and will also be available online within a few days of the ceremony at www.gradphotos.biz. In addition to photos, customized plaques, tassel display frames, and various other products will be available to order through the website or the mailed proof and order form. The Fox does not allow balloons, noise makers, food or beverages into their theater. Please contact us if you do not see the commencement information you need. Thank you to Albertsons Companies for their financial support of our commencement celebration. *Please submit your regalia order form directly to the Bookie.